ESL Trusted grants you a unique verified digital identity, account security and more. 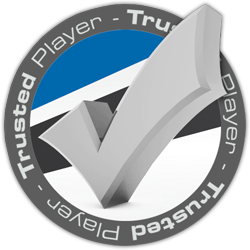 Support ESL Play by becoming a Trusted player, helping us grow the Amateur Esports Community. One of the biggest challenges of Online Gaming is the Internet’s anonymity. Making a new account is way too easy. For this reason ESL Trusted was established on the 1st of October 2005. New ESL Trusted players receive their verification key via mail to confirm their address and identity. This process allows each person to own only one ESL account. How can I get ESL Trusted? The process is quite simple. First you start your Trusted registration by providing some personal information plus a picture of yourself. This information is only visible by certain eligible Turtle Entertainment GmbH employees and handled with care. Once the data submission is completed, you will be asked to make a payment of 8.95 EUR, which covers 3 years of ESL Trusted. Once the payment is complete, your account and data will be checked and verified by a Turtle Entertainment GmbH employee. Once the verifications are complete, a letter will be sent to you with a verification code, which you will need to enter in order to activate your Trusted status. The process from your payment until the verification is sent takes on average 2-4 business days. Your personal data is securily saved with your ESL account, and is deleted when if your account is deleted. Only certain Turtle Entertainment GmbH employees can see your personal data. Your data will be used for verification and account recovery purposes. Your data will not be given to a third party! Furthermore, your data will be locked and non editible by you. If your home address changes and needs to be updated, please contact the ESL Trusted support. Can I change my personal data once I become a ESL Trusted player? You are not able to change the data after you have ordered the ESL Trusted. It is possible however to update your home address if you move during your Trusted status. If you wish to update it, you can send us your new address by opening a ticket to the ESL Trusted support squad. A copy of your ID card is needed together with an official letter in your name with your new address (for example a power/water bill, letter from your bank, etc). You can hide all the contents of that letter. We just need to see your name, your new address and the sender in order to verify your new address without the user of a verification code. What happens when my ESL Trusted status runs out? Once your 3 year status runs out, your account will lose the Trusted status and all the perks that come with it. It is possible to extend your Trusted status by starting a new order process here. What does Instant league sign-up mean? Certain competitions we run on ESL Play, such as Pro qualifier tournaments, require us to use a join verification system, which requires an ESL admin to approve your sign-up. As a ESL Trusted player, you do not have to go through such verification, making your sign-up instant. This can be very beneficial in tournament with limited registrations. I cannot access my account. What can I do? A new email address that should be registered in your old account (it will be used to login and retrieve the password). This email cannot be in use in any other ESL account. Since your data is important for us, only certain Turtle Entertainment Employee's can have access to this tickets. Because of this, your request may take up to 3 business days to be handled. Please refrain from creating a new ESL account in order to recover your former one, as you are only allowed to own one user account.